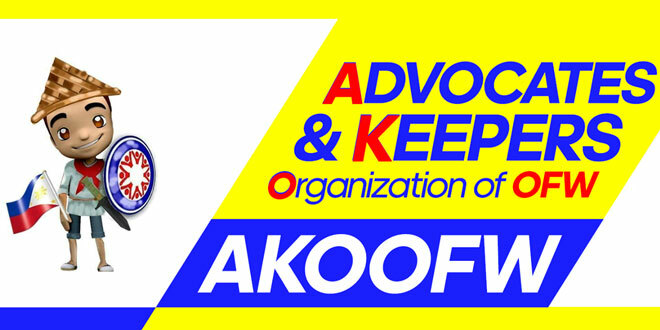 IN reaction to difficulties faced by overseas Filipino workers in their work place and working conditions, the Advocates and Keepers Organization of OFWs Inc. (AKO OFW Inc.) has launched the ‘Bantay OFW Mobile Application’ in partnership with the Philippine Overseas Employment Agency (POEA) for speedy and efficient response to distressed OFWs working abroad. A memorandum of understanding (MOU) had been signed by both parties to provide a convenient, affordable, accessible and swift means to monitor, check and safeguard Filipino workers right at the jobsite abroad especially the gender-sensitive and most vulnerable sector, the household service workers (HSW) without cost to the Philippine government. Speaking at the regular session of the weekly Kapihan sa Manila Hotel forum, AKO OFW chairman Celerino ‘Dok Chie’ Umandap explained that ‘Bantay OFW Mobile App’ will only serve as medium of communication and cannot be a tool in imposing administrative sanctions. “The Bantay OFW Mobile App’ as conceptualized will serve as avenue for convenient communications relative to the living and working conditions and or significant occurrences affecting OFWs. It shall aid the government in monitoring the status and plight of OFWs and the consequential actions undertaken by the concerned Philippine Recruitment Agency (PRA), Foreign Recruitment Agency (FRA) and employer,” Umandap pointed out. “It shall also underscore civil, friendly and receptive responses to all and users will at the same time maintaining privacy of communication,” he added.